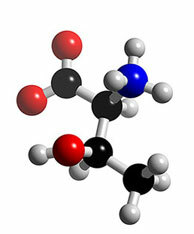 Threonine is an essential amino acid. Animal organism does not synthesize it. Symptoms of lack of threonine is intensive lagging in growth and advancing. Threoine is a crystal powder of whitish and pale yellow color, without a specific smell. It is produced by fermentation of natural materials of agricultural origin such as turnip molasses or starch hydroxides. The content of active substance-threonine is 98%. It is used as a supplement in live-stock nutrition production for nutrition of piglets, sows, pigs fattened, chicken fattened, egg-laying hens, calves (as milk replacement) turkeys, hares, but as a pets’ and fish food supplement, as well. The Term of Usage At least 3 years from the production date.